Legislative funding shortfalls for Washington's foster care system, which underly the extraordinarily high payments to at least a few foster homes, sparked this protest by foster youth last spring. 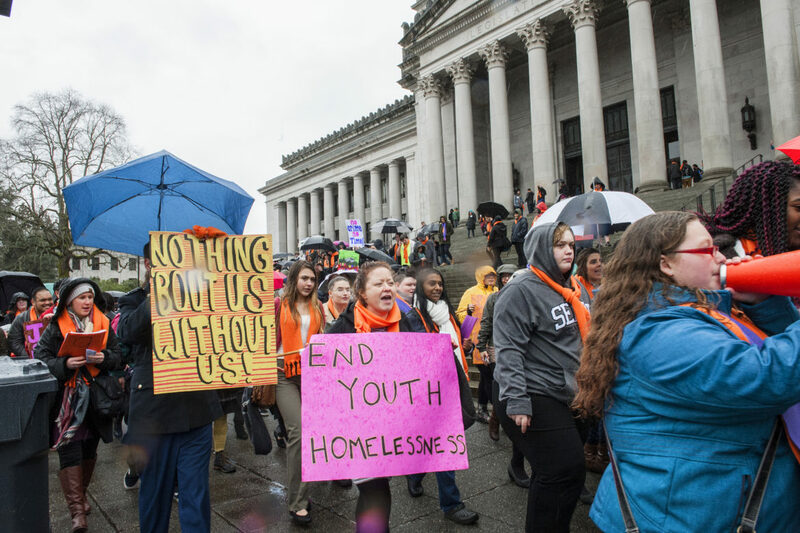 OLYMPIA – Wrapped in blaze-orange scarves against a steady rain, about 300 marchers rallied Friday at the Capitol to urge lawmakers to do more for children who are homeless or in foster care. Most were young people in their 20s who themselves have experienced the child welfare system or homelessness — often both. The day’s events, which included meetings with legislators and a march around the Capitol campus, were organized by The Mockingbird Society, a child welfare reform nonprofit organization that teaches young people to be advocates. Washington First Lady Trudi Inslee spoke to attendees at The United Churches of Olympia before they set out to meet with legislators. She urged the young people to share their stories with lawmakers. “These folks have to learn from you,” she said. InvestigateWest, Crosscut.com and KCTS9 have in recent months reported how the foster-care system has descended into crisis as foster parents increasingly have abandoned the system, many complaining of ill treatment at the hands of the understaffed Department of Social and Health Services. Meanwhile, DSHS caseworkers are departing. The result: foster youths are shuffled from home to home, sometimes to dozens of homes within a matter of months, making their already-chaotic lives even worse. In meetings with 40 legislators or their aides, the youth on Friday sought support for a half-dozen bills and budget items related to retaining foster parents, helping foster kids get drivers licenses and keeping youth out of juvenile detention, among other requests. Minnie Bliesner took an early morning flight from Spokane to tell legislators how she bounced between 16 foster and group homes between the ages of 7 and 19. Given all that instability, Bliesner, now 21, urged lawmakers to maintain about $500,000 in funding for the Mockingbird Family Model of foster care, in which networks of up to 10 foster families receive support from an experienced foster home and each other. That helps keep foster parents from burning out. Some of the items the youths advocated had come out of conversations about their own challenges. One of those bills aims to address the difficulty foster youth have obtaining a driver’s license, since they often don’t have an adult willing to teach them to drive or help with insurance. Without the ability to drive, getting to work or to school, especially with the frequent moves many foster youth experience, can become nearly impossible, they say. For young people climbing out of foster care, a driver’s license is key. The proposed bills (HB 1808/ SB 5663), modeled after a successful program in Florida, would create a pilot program to reimburse foster kids for driver’s education, permits and licenses. Increasing funding for services that help teens in crisis stay with or reunite with their families. The state government’s leading official responsible for helping foster youth, Assistant Secretary of the Children’s Administration Jennifer Strus, was also scheduled to speak to the group but did not attend. How the Legislature will respond to the crisis in the foster care system was left unanswered on Friday. A huge question is whether, in a year when the Legislature is hard-pressed to meet multi-billion-dollar education funding needs that can be legally enforced, it will do anything for foster kids who have no such legal firepower. InvestigateWest is a Seattle-based nonprofit newsroom producing journalism for the common good. Please help support this effort at www.invw.org/donate. This reporting was supported by InvestigateWest donors, the Fund for Investigative Journalism and the Thomas V. Giddens, Jr., Foundation. With thousands seeking to build rural homes, will Legislature cut off water for fish?